When it comes to dog food, there is an endless variety to choose from. Each product is unique, though they may look very similar until you take a closer look. Dog food can be divided into many categories and understanding those categories is the key to picking out a healthy and high-quality dog food for your dog. Holistic dog food is one of the best options out there because it is made with wholesome, natural ingredients and designed to provide your dog with completely and balanced nutrition. Keep reading to learn more about your dog’s basic dietary needs and to receive some tips for picking the best holistic dog food. You’ll also receive our top 5 picks for the best holistic dog food. What is Holistic Dog Food? 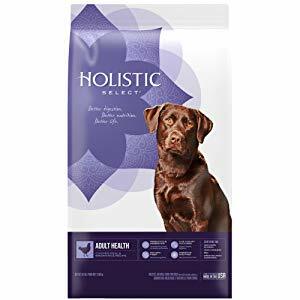 There is no legal definition for the word “holistic” when it comes to dog food, so don’t believe everything you read on a dog food package. Generally speaking, however, holistic products are made with all-natural ingredients with no artificial additives. They are also usually made with whole-food ingredients and supplemented to ensure nutritional balance. Natural Ingredients – A holistic dog food should be made with all-natural ingredients rather than by-products and unnamed proteins or fats. Look for a high-quality source of animal protein and fat at the top of the list with digestible carbohydrates. Nutritional Balance – All dog foods use synthetic vitamin and mineral supplements to ensure complete and balanced nutrition, but a good holistic dog food will also contain fresh fruits and veggies to provide natural sources for some of those nutrients. Beneficial Supplements – In addition to vitamins and minerals, a good holistic dog food will contain other beneficial supplements to support your dog’s whole-body health. Examples include prebiotic fibers, probiotics, and joint-supporting nutrients. No Additives – Just as important as the ingredients included in holistic dog food are the ingredients not included. Holistic dog food should be free from artificial additives including colors, flavors, and chemical preservatives. When it comes to choosing the best holistic dog food, you need to consider your dog’s basic nutritional needs as well as the quality of the product itself. All dogs require a protein-rich diet to support their lean muscle mass. This protein is best when it comes from animal-based sources because they are complete proteins that provide all 10 essential amino acids. Your dog needs at least 18% protein. After protein comes healthy fat, a rich source of energy and essential fatty acids for healthy skin and coat. Again, this should come from animal-based sources, though plant oils can be used to provide a balance of omega-3 and omega-6 fatty acids. Your dog needs at least 5% crude fat in his diet, more depending on his breed size and activity level. Your dog has no specific requirements for carbohydrates in its diet other than they be digestible. Holistic dog food usually contains whole grains or grain-free carbohydrates like sweet potato, peas, and chickpeas. In addition to carbohydrates, holistic dog food should contain vitamins and minerals for nutritional balance and other supplements like probiotics for healthy digestion. Again, all of these ingredients should be completely natural and the recipe free from artificial additives. Keep reading to see our top 5 recommendations for the best holistic dog food. A good holistic dog food starts with all-natural ingredients. Look for premium sources of animal protein and fat, digestible carbohydrates, and fresh fruits and veggies as well as vitamin and mineral supplements to ensure whole-body health. The Holistic Select brand is dedicated to providing high-quality nutrition for dogs through the use of wholesome, natural ingredients. Their recipes are designed for digestibility to ensure that your dog gets the maximum benefit from the nutrients. This recipe features protein-rich chicken as the main ingredient with digestible carbohydrates like brown rice and oatmeal. It also contains fresh fruits and vegetables as natural sources for key nutrients and beneficial supplements for balance. Plus, it contains digestive enzymes and live cultures to ensure healthy and regular digestion. 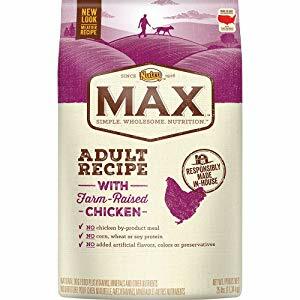 If you’re looking for a holistic dog food but you don’t have a big budget to work with, try this Nutro Max Farm-Raised Chicken Recipe Adult Dog Food. This recipe contains 24% crude protein and 14% fat, primarily from high-quality animal sources like chicken meal and chicken fat. This formula is completely free from by-products, low-quality fillers, and artificial additives so you can feel good about feeding it to your dog. You’ll also be glad to know that it’s very digestible and supplemented with chelated minerals. Chicken Meal (Source of Glucosamine and Chondroitin Sulfate), Whole Grain Sorghum, Brewers Rice, Whole Grain Oatmeal, Chicken Fat (Preserved with Mixed Tocopherols), Chicken, Dehydrated Alfalfa Meal, Flaxseed, Natural Flavor, Whole Brown Rice, Peas, Chickpeas, Potassium Chloride, Salt, Choline Chloride, Dl-Methionine, Zinc Sulfate, Niacin Supplement, Biotin, Vitamin E Supplement, D-Calcium Pantothenate, Riboflavin Supplement (Vitamin B2), Vitamin B12 Supplement, Iron Amino Acid Chelate, Copper Amino Acid Chelate, Selenium Yeast, Pyridoxine Hydrochloride (Vitamin B6), Manganese Amino Acid Chelate, Vitamin A Supplement, Thiamine Mononitrate (Vitamin B1), Vitamin D3 Supplement, Potassium Iodide, Folic Acid, Rosemary Extract, Decaffeinated Green Tea Extract, Spearmint Extract. 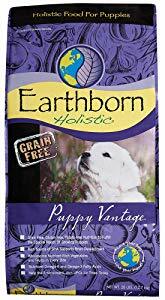 If you want to get your puppy started off on the right foot, try this Holistic Select Puppy Vantage Grain-Free Dry Food. It features chicken meal as the main ingredient and a concentrated source of protein with chicken fat for energy and nutrients. It contains dried fruits and vegetables to provide natural sources of key nutrients with chelated minerals to ensure optimal nutrient absorption. You’ll also be glad to know that it is completely grain-free and supplemented with probiotics for healthy digestion. Chicken Meal, Peas, Pea Starch, Chicken Fat (preserved with mixed Tocopherols), Whitefish Meal, Flaxseed, Pea Fiber, Natural Flavors, Dried Egg, Blueberries, Cranberries, Apples, Carrots, Spinach, Dicalcium Phopshate, Salt, Potassium Chloride, Choline Chloride, DL-Methionine, L-Lysine, Taurine, L-Carnitine, Beta-Carotene, Vitamin A Supplement, Vitamin D3 Supplement, Vitamin E Supplement, Zinc Sulfate, Ferrous Sulfate, Niacin, Folic Acid, Biotin, Manganese Sulfate, Copper Sulfate, Calcium Pantothenate, Thiamine Mononitrate, Pyridoxine Hydrochloride, Riboflavin Supplement, L-Ascorbyl-2-Polyphosphate (source of Vitamin C), Zinc Proteinate, Manganese Proteinate, Copper Proteinate, Calcium Iodate, Sodium Selenite, Cobalt Carbonate, Vitamin B12 Supplement, Yucca Schidigera Extract, Rosemary Extract, Dried Enterococcus Faecium Fermentation Product, Dried Lactobacillus Casei Fermentation Product, Dried Lactobacillus Acidophilus Fermentation Product. As your dog gets older, the quality of his diet matters even more. 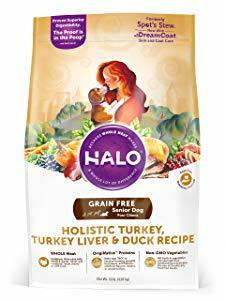 The nutrients he does or doesn’t get have a direct impact on his health and wellness, so choose a holistic dog food like Halo Holistic Grain-Free Natural Dog Food for Senior Dogs. This recipe features fresh turkey as the main ingredients with dried legumes and peas for carbohydrates. It is rich in healthy fats for energy and skin/coat health with chelated minerals for nutritional balance and probiotics for healthy digestion. Turkey, Dried Chickpeas, Dried Lentils, Dried Peas, Dried Egg Product, Turkey Liver, Dried Sweet Potatoes, Duck, Pea Fiber, Chicken Fat (Preserved With Mixed Tocopherols), Natural Flavor, Flaxseed, Dicalcium Phosphate, Pea Protein, Soy Protein Concentrate, Calcium Sulfate, Dried Golden Algae, Dried Bacillus Coagulans Fermentation Product, Dried Blueberries, Dried Cranberries, Dried Carrots, Calcium Carbonate, Inulin, Salt, Vitamins (Vitamin E Supplement, Niacin Supplement, Thiamine Mononitrate, D-Calcium Pantothenate, Vitamin A Supplement, Pyridoxine Hydrochloride, Riboﬂavin Supplement, Vitamin D3 Supplement, Vitamin B12 Supplement, Folic Acid, Biotin), Potassium Chloride, Minerals (Zinc Methionine Complex, Zinc Sulfate, Iron Proteinate, Ferrous Sulfate, Copper Proteinate, Copper Sulfate, Manganese Proteinate, Manganous Oxide, Sodium Selenite, Calcium Iodate, Ethylenediamine Dihydroiodide), Mixed Tocopherols (Preservative), Taurine, L-Ascorbyl-2-Polyphosphate, L-Carnitine. If your dog suffers from food allergies, it may not be enough to feed him a holistic dog food – you might need a holistic dog food specifically designed for dogs with sensitive stomachs. 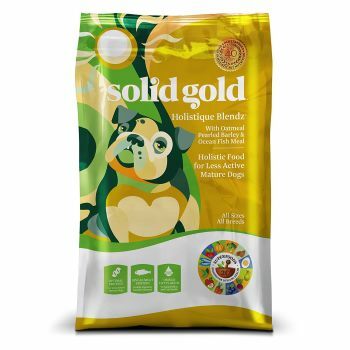 This Solid Gold Sensitive Stomach Dry Dog Food is all-natural and made with digestible whole grains as well as premium animal proteins. It features oatmeal, pearled barley, and peas as well as ocean fish meal and chicken fat. It also contains dried fermentation products for probiotic support and fresh fruits and veggies. Oatmeal, Pearled Barley, Peas, Ocean Fish Meal, Chicken Fat (Preserved with Mixed Tocopherols), Natural Flavors, Dicalcium Phosphate, Tomato Pomace, Dried Eggs, Flaxseed, Potassium Chloride, Salt, DL-Methionine, Choline Chloride, Salmon Oil (Preserved with Mixed Tocopherols), Dried Chicory Root, Carrots, Pumpkin, Parsley, Apples, Cranberries, Blueberries, Lettuce, Celery, Beets, Watercress, Spinach, Broccoli, Spearmint, Almond Oil (Preserved with Mixed Tocopherols), Sesame Oil (Preserved with Mixed Tocopherols), Yucca Schidigera Extract, Dried Kelp, Thyme, Lentils, Vitamin A Supplement, Vitamin D3 Supplement, Vitamin E Supplement, Zinc Sulfate, Niacin, Ferrous Sulfate, L-Ascorbyl-2-Polyphosphate (Source of Vitamin C), Calcium Pantothenate, Thiamine Mononitrate, Copper Sulfate, Riboflavin, Pyridoxine Hydrochloride, Manganese Sulfate, Zinc Proteinate, Folic Acid, Calcium Iodate, Manganese Proteinate, Copper Proteinate, Sodium Selenite, Biotin, Vitamin B12 Supplement, Rosemary Extract, Dried Lactobacillus Acidophilus Fermentation Product, Dried Enterococcus Faecium Fermentation Product, Dried Lactobacillus Casei Fermentation Product. The amount you feed your dog depends on its age, breed, and body weight. Small breeds need more calories per pound of body weight than large dogs, so they may need three meals a day versus the two meals that is appropriate for medium to large dogs. In terms of the actual volume of food, that will depend on the product you choose because all dog foods have different calorie content. Choose a high-quality dog food formulated for your dog’s breed size then follow the feeding recommendations on the package based on its age and weight. 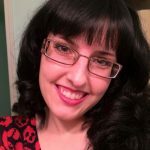 What About Food Allergies and Sensitivities? All dogs have the potential to develop food allergies and sensitivities, but holistic as well as best Hypoallergenic dog food reduces those risks by removing low-quality ingredients and artificial additives from the equation. All-natural ingredients are easier for your dog’s body to digest, so make sure the holistic dog food you pick contains whole food ingredients. If your dog is allergic to a common protein or another ingredient, you may want to find a limited ingredient diet or switch it to a grain-free recipe. While you can’t always believe what you read on a dog food label, it is generally safe to assume that holistic dog food offers quality nutrition. Take what you’ve learned here to start shopping for holistic dog food or try one of our top 5 picks for the best holistic dog food.